ISA hosts four state-of-the-art NMR systems operating at 300, 400, 600 fitted with room-temperature probes and a 600 MHz with cold-probe. The NMR systems are devoted to the analysis of organic molecules and biological macromolecules solutions including aqueous media. The instruments are located into two dedicated NMR halls of about 100 m2 in highly-regulated environments for a best instrumental stabiltility and quality measurements in high-resolution NMR for liquids. The 400 MHz and the two 600 MHz NMR systems are also equipped with auto-samplers for automated large series data acquisitions. 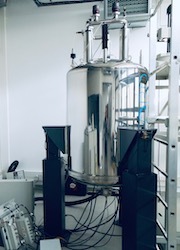 Multidimensionnal NMR correlation spectroscopy is routinely conducted using 1H, 15N, 13C, 19F, 31P radio-frequency channels for structures analysis as well as relaxation-rates measurements and diffusion-ordered spectroscopy (DOSY or PFG-Diffusion NMR) to evaluate quantitatively the rotational and translational diffusion for solute molecules and their interactions. The high-sensitivity of the cold probe 1H and 13C enhanced allows 1H-13C correlation spectroscopy for ten’s microgram samples for organic molecules at natural abundance.